The project will provide sustainable and resource-efficient restoration of degraded territories, owned by municipalities. Cross border cooperation will ensure more efficient resource and best practice applying. The project will carry out regeneration of brownfields in six places, provide innovative and professional brownfield planning, and promote the qualitative development of brownfields in the future. Within project following activities will be carried out: two degraded building scheduled for the disassembly is not suitable for living in Saldus and Ventspils county municipalities, regeneration of a ditch and pond polluted with oil products in Kuldiga, cleaning up of urban area (former Soviet military base) in Skrunda with an area of 11,34 ha, reconstruction of a stadium in Kauna with an area of 1,04 ha and territory of the “military town” cleaning from petroleum products in Telsiai with an area of 3 ha. Klaipeda district municipality will prepare pond recreational project. Specialists from all partners will increase their professional knowledge by participating in training and experience exchange trips. In total, the project will provide a clean environment in 16,32 ha in Kurzeme, Kaunas, Klaipeda and Telsiai. 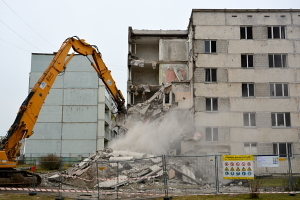 A derelict multi-appartment dwelling building has been pulled down at Ugāle, Ventspils County. On March 6 and March 7, 2019, project management group meeting and thematic workshop took place in Telsiai. On February 7, 2019, the second “Clean Brownfields” project seminar took place in Skrunda. Thanks to Latvia – Lithuania programme support two brownfield territories have been put in order in Kurzeme. On November 27, 2018 round – table discussion was organized in Telsiai. From October 8 till October 12 representatives of Kurzeme municipalities and Kurzeme Planning Region together with representatives from Lithuanian municipalities and Kaunas Regional Development Agency went for a study visit to Poland and Germany to get acquainted with their experience about brownfield regeneration. The first seminar from the series of five LLI – 303 “Clean Brownfields’ project seminars has been successfully completed on September 5, Saldus. On April 23, 2018 Subsidy contract was concluded between Ministry of Environmental Protection and Regional Development and Kurzeme Planning Region for implementation of the project LLI 303 “Life in Clean Environment – a Better Future !” (“Clean Brownfields”), Interreg V-A Latvia – Lithuania Programme 2014 – 2020.